In this video we will discuss customising the ngx-bootstrap datepicker component with an example. This is continuation to Part 11. Please watch Part 11 from Angular CRUD tutorial before proceeding. At the moment we have date range picker. 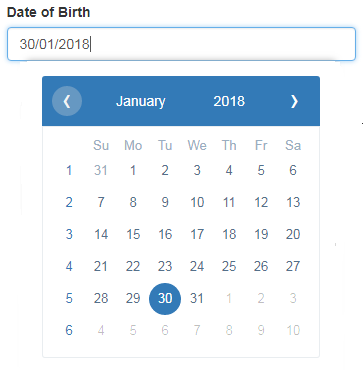 Use bsDatepicker directive instead of bsDaterangepicker directive on the input element so we can capture single date i.e the Date of Birth of the employee. Changing ngx-bootstrap datepicker theme : At the moment, the Datepicker is using the default green theme. We want to change it to dark-blue theme, so it matches with the rest of the form. As of this recording ngx-bootstrap datepicker component has the following 6 color schemes. We can change the default colour-scheme, by manipulating containerClass property in bsConfig object. Here are the steps. // change the color theme using the containerClass property. We are using the TypeScript partial type here to set only the "containerClass" property of BsDatepickerConfig object. To learn more about the partial type please refer to the following article. Object.assign() copies the property values from one or more source objects to a target object. The target object is the first parameter and the rest are the sources. Object.assign() is useful for merging objects or cloning them shallowly. Step 2 : In the view template (i.e in create-employee.component.html file) bind the "datePickerConfig" property in the component class we created above in Step 1, to the bsConfig input property. At this point, you should see the Datepicker using the dark-blue theme colour as shown below. Showing or hiding week numbers : By default, the weeknumber are displayed. If you want to hide them, all you have to do is set "showWeekNumbers" boolean property to false in the config object as shown below. You can find all the properties of the config object at the following page. Along the same lines we can also set the min and max dates. Please note that the month numbers start from 0 and not 1. So for January it is 0, February it is 1, so on and so forth. To change the date format, use dateInputFormat property of the config object. To set a default date, create a property (dateOfBirth) in the component class and set it to the default value you want. Since we are using 2 way databinding, the defualt date is displayed in the corresponding input field when them form loads. In this case we have set default date to January 30, 2018. To control the placement of the Datepicker use the placement property. The allowed values are "top" | "bottom" | "left" | "right". The default is "bottom". But its return 'Mon Jan 01 0018 00:00:00 GMT+0530 (India Standard Time)' format. plz. guide me.